Social Media is a great way to help build your brand online and reach new audiences who might be interested in your products or services. By using platforms like Facebook, Twitter, Pinterest, Linkedin and more you can drive targeted traffic back to your website and also engage with your audience in a less formal setting. Top brands understand the importance of social media and if done correctly, you can greatly enhance your business – social media lets everyone compete on a level footing so smaller companies can stand side to side with huge corporations, and even beat them with the right strategy. To help build your social media profiles and grow your followers, you should be using your existing website traffic to build them, by adding links to your social profiles and providing easy ways for people to share your content you can grow your followers which you can then keep engaged on social media and drive them back to your site when you have news worth sharing – new blog posts, new products and so on. One thing we love about social media is how it revolutionizes the way we share information. Maximizing social media to your advantage is essential to your success as a blogger. Clicking on the “share” button will post the same content to your social media account, while readers can easily subscribe to get instantaneous updates on new posts. WordPress social media plugins make life easier in terms of growing your profile, acquiring new subscribers, increasing your content shares and getting more traffic for your website. The good thing is that social media plugins for WordPress are a dime a dozen- you will almost always find something that fits what you need! We’ll show you the 10 best WordPress social media plugins you can use today. What To Look For In A Social Media Plugin? 0.1 What To Look For In A Social Media Plugin? For one, you should think about which social media is the most important platform to display on your blog site. Less clutter means a more enjoyable user experience for your visitors. Limiting to the most popular social media relevant to your niche gives you a higher chance that you’ll get more shares per content. 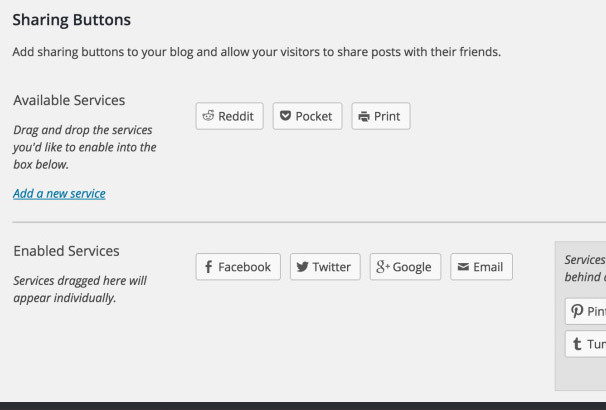 The plugin should allow you to display your social media buttons anywhere on the site. For function and aesthetic value, you should be able to put these buttons on top of, below, or on the side of the content you post on your blog. Oftentimes, social sharing plugins tend to bog down your site’s speed and performance because they contain scripts and added stylesheets. The best plugins are those that give a good balance between functionality and site performance. A social media plugin may have a lot of features, but your visitors may have an unpleasant user experience. You’ll also want to get some level of support when things go wrong. 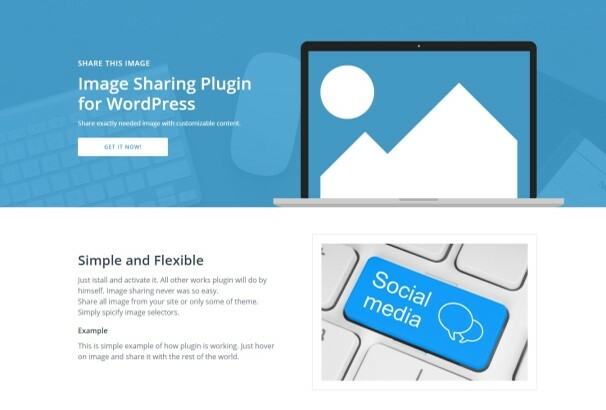 In this list we have collected together over 50 hand-picked social media plugins for WordPress, these plugins will let people share your posts, follow your accounts, they can display how many shares and followers you have which helps with “social proof”. We have also listed a number of content locker plugins, these let you offer something for free like an eBook or file download in exchange for the persona sharing your link on their social media pages. I have personally used such plugins in the past with great effect – I was able to generate thousands of likes, tweets and follows so definitely consider using one if you are currently giving away something for free on your website. 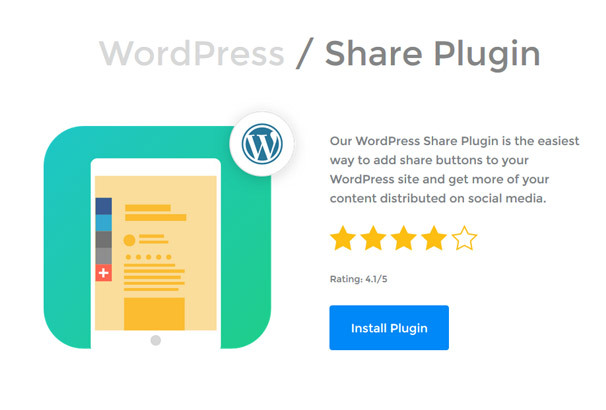 Take a look below at our comprehensive list of 50+ Free & Paid WordPress Social Sharing Plugins! Looking for a plugin that gets top ratings and comes from a reputable company? 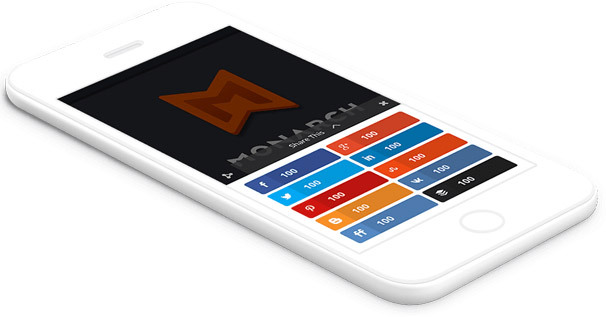 Monarch, by Elegant Themes is a robust plugin that supports more than 20 social media networks and provides handy sharing tools at your disposal. 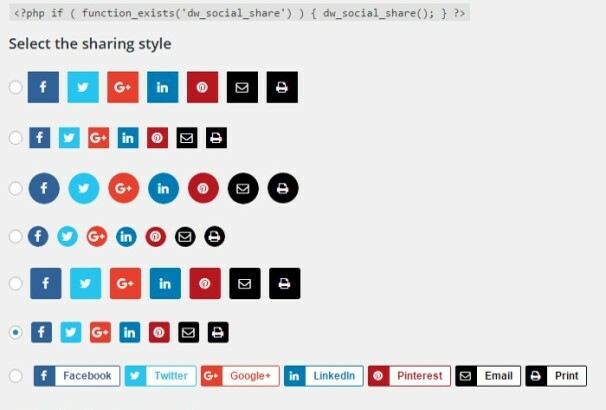 You can experiment and find the best spot to place your social media share buttons. Set it to be a floating sidebar so your readers will have an easier time sharing your engaging content. Moreover, you get to choose what icons to display and their arrangement. Need more customization? No problem. Monarch will allow you to change orientation, shape and size as well. That’s not all. You can set a time delay and triggers for when the social share buttons start appearing. Have a 3-minute content? You can make the share buttons appear in 2 minutes, or when they scroll down at the end of your piece. Monarch is smart enough to know when the reader is at the top or at the bottom of the article. The icons scale down to the appropriate size when viewed on smaller mobile screens. Have a post that’s rich in media? Display share buttons right beside your photo gallery or video content. 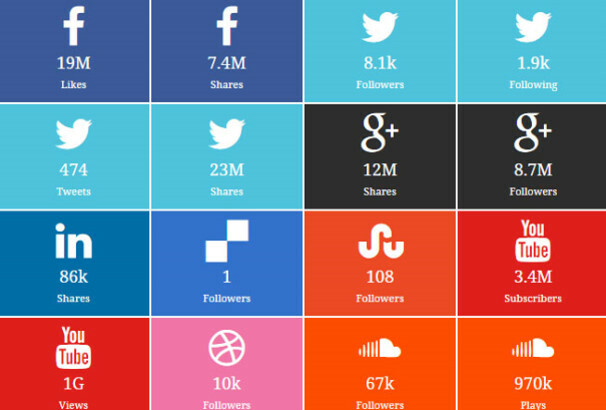 The number of follows, shares and likes are monitored and tracked down in a masterful dashboard. You can pull the stats to your WordPress dashboard. Import and export Monarch settings at will. Get 20% Off Monarch with Our Coupon Code Here. If you’d like total granular control over how and where your social media buttons are displayed, then Easy Social Share is for you. The wealth of features found here make it one of the best plugins in the WordPress platform. Open it and you’ll be treated to a smorgasbord of customization options in terms of placement and visual designs. ESS is compatible with almost all bookmarking sites (Viber, WhatsApp, Telegram, etc) and all the popular social media sites. Choose from over 50 beautiful templates, 27 design positions, 30-plus animations and much, much more. You can spend hours trying each one of them because they’re all so good! A fee of $19 puts you in command of installing this plugin to any or all of your websites. You also get useful A/B Testing tools and see how social media buttons are triggered via user-based actions, whether they immediately click share after scrolling down or when they’re about to exit the page. Jetpack is one of the more versatile WordPress plugins available for WordPress bloggers. Automattic, the company behind WordPress, has released more than 30 modules for it, with more coming out each year. Jetpack is simple, easy and intuitive. You get support for 9 of the most popular social media platforms, a print and an email button. Choose whether to display the original share buttons or spice it up by showing icons, icons plus text or text only links. Jetpack will allow you to put those buttons anywhere you like- on search results, archives, pages, on media and posts, and even on your home page. Twitter usernames and sharing labels can be renamed. Install Jetpack and you’ll be posting social share buttons in a matter of minutes. Posting on social media can take up a lot of your time, but it’s very important in keeping your viewers engaged and coming back for more. 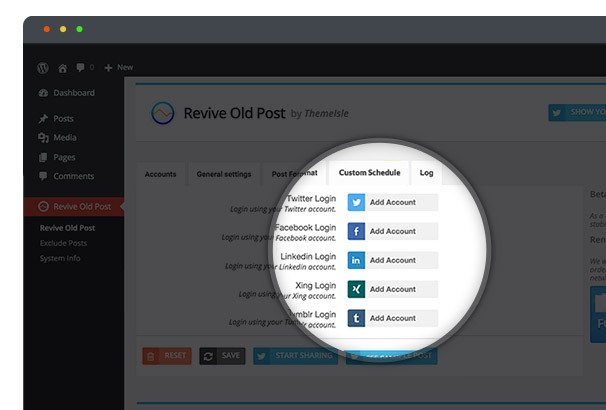 Revive Old Post is a very useful plugin for when you want to re-circulate oldie but goodie posts to share with your audiences on various social media accounts. It’s an excellent way for your followers to discover useful content that they may have missed. It only takes a few minutes to learn how to share your old posts in WordPress. After that, you can set it to autopilot and focus on other important things. 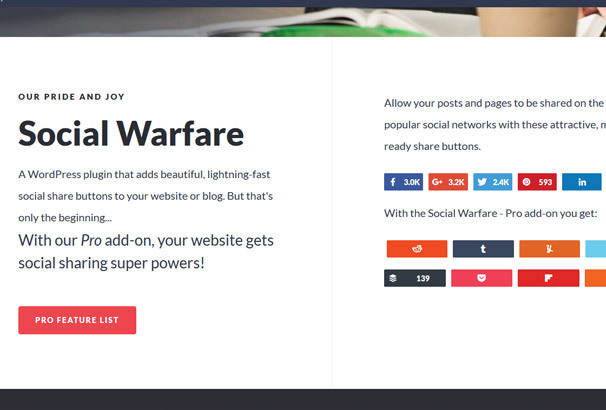 Social Warfare makes it super easy to add social media buttons on a whim. You can add them above or below your post, or as a floating widget that stays with the visitor. You can even use shortcodes for easy insertion. Your readers will be able to share your photos and automatically have it fit into recommended sizes without changing the featured image size. This means Pinterest-friendly images and Facebook-optimized photos right off the bat. 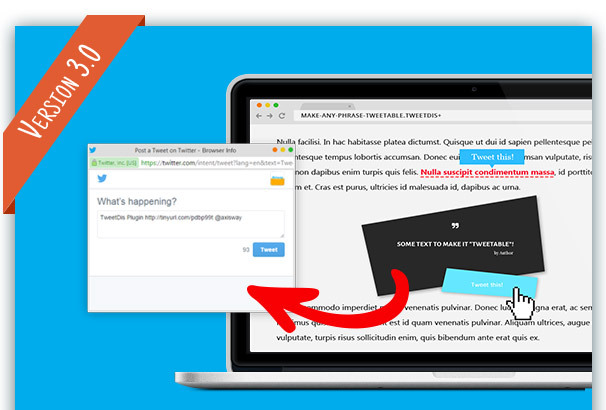 Help your viewers share your posts on Twitter by adding tweetable quote boxes. You can set where and how share counts are displayed on your blog. Last but not the least, you can track social shares with a handy UTM tracking code, all for a small yearly fee starting at $29. 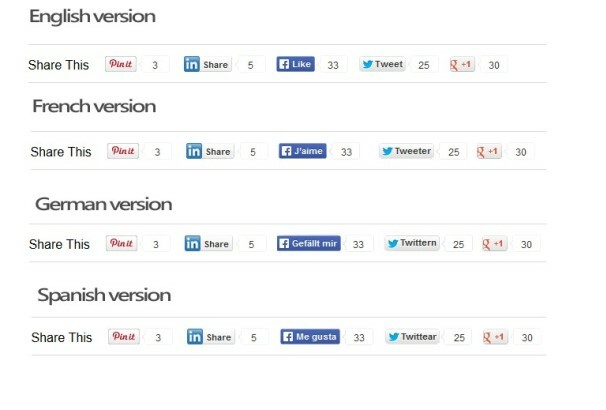 To use the AddThis social media plugin, you’ll need to register with the AddThis service first. Free users get to choose from any of the 5 available share positions, with 5 more being unlocked when you upgrade to the pro plan at a monthly fee of $12 or a yearly fee of $99. Everything can be done on the AddThis website as long as you install the plugin and activate your AddThis account. When you make changes, your WordPress site will be automatically updated with the new settings. Nonetheless, the buttons are easily shared and the plugin is easy to use. Some of the basic features include the size and the placement of the buttons and the page share count. 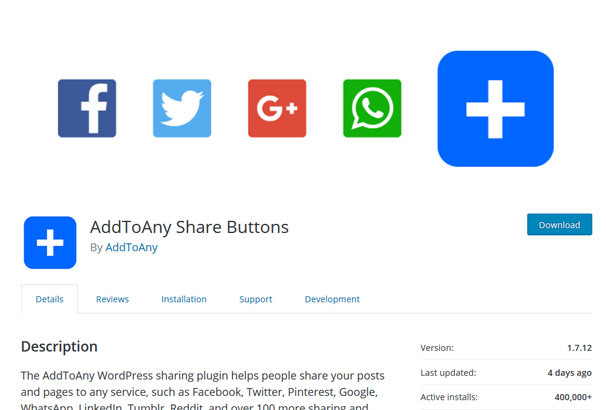 AddtoAny is one of the first ever WordPress plugin to address social media sharing via buttons, and they are still standing strong today. Install it as a plugin and you can opt for standard or floating social media buttons to show up on your blog page. Optimal icon sizes are essential to good user experience, and AddtoAny knows it. The plugin allows you to set icon size and even create a custom size when the default offering isn’t what you need. There’s a cool universal button that expands to show many social network share buttons when your readers hover over it. Last but not the least, AddtoAny features integrated Google Analytics for when you need to track your numbers. Bloggers should get TweetDis if Twitter is one of their major platforms for sharing content. With it, users can create tweetable quotes with just a few button presses. You can even tweet images using this versatile WordPress social media plugin. Choose from the many possible designs available to suit your site’s theme. Add “Click to Tweet” and customize them to great effect. The call to action can also be personalized. Assign a default @username to tag along with your tweets. It is what is sounds like- a straightforward, no-frills social media plugin that won’t hamper your site’s performance. A minimalistic share button will grace your blog posts either at the top or at the bottom of your content. You can add these buttons to the excerpts, the archives and on your main homepage. 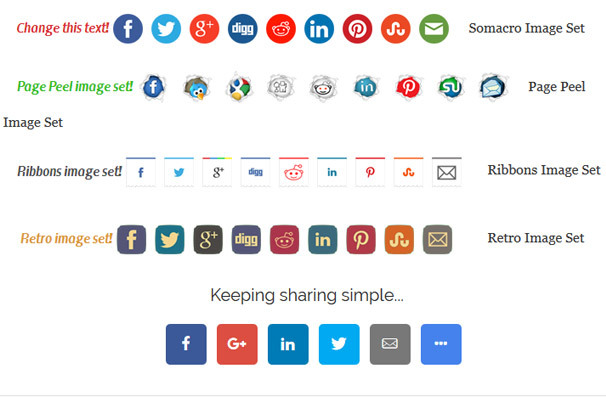 Simple Share Buttons Adder is compatible with 15 social media sites; there’s a way to change the text that appears alongside the network share buttons. Furthermore, you can change the container, alignment and styling to complement your blog theme. SSBA allows you to scale your icons so that it looks good on mobile screens. The share statistics can be turned on and set to be displayed on its own widget. Think Mashable, and you’ll have the right idea. 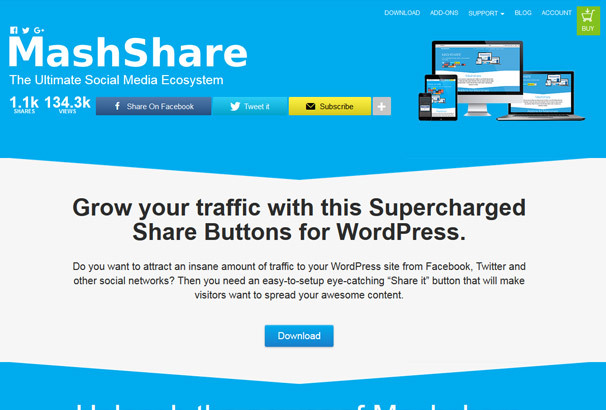 Mashshare is a brave new plugin for social media bloggers. It comes in either the free or paid version. The free one can display the number of views and shares while offering viewers the chance to share your content via Twitter or Facebook. 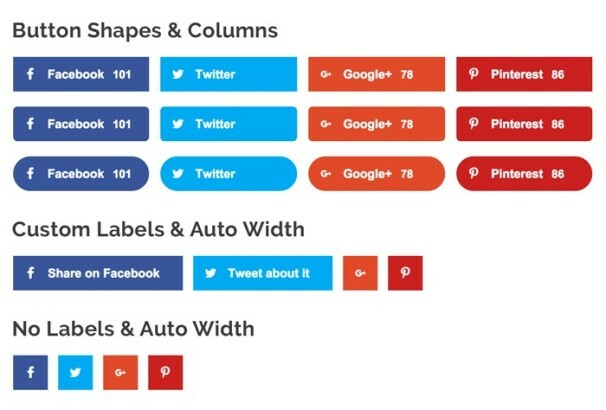 Blog owners can place these buttons below or above posts, and on certain pages or posts. This nifty plugin also has a subscription box that can be edited using WordPress. You can choose to put the subscribe link straight on the URL side. This is one unique feature that Mashshare has an edge with against all other social media plugins. This plugin adds a widget which allows you to display your social media profiles in your sidebar or any widgetized area and show off how many fans / followers you have which acts as social proof for your website. This plugin creates a simple floating bar which will help attract your visitors attention and hopefully encourage them to share your content. It supports multiple languages : English, Spanish, German, French, Chinese, Russian and Dutch. 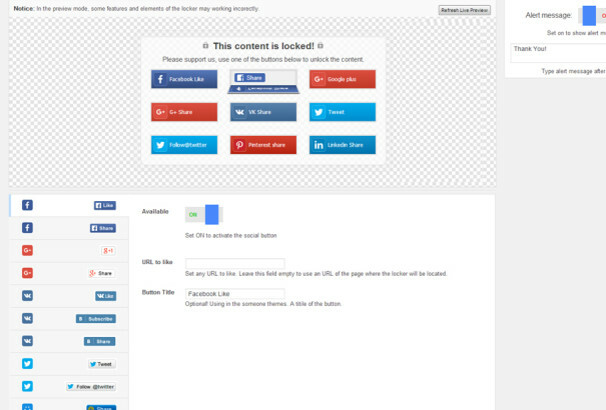 Super Social Content Locker allows you to lock parts of your website content which can only be viewed or accessed once the visitor shares, follows you or watches an advertisement video. This is another popular Social Locker plugin used on thousands of blogs for encouraging social media interactions in return for content. Share this image allows your visitors to share images from your website on 11 different social media websites with a click of a button. 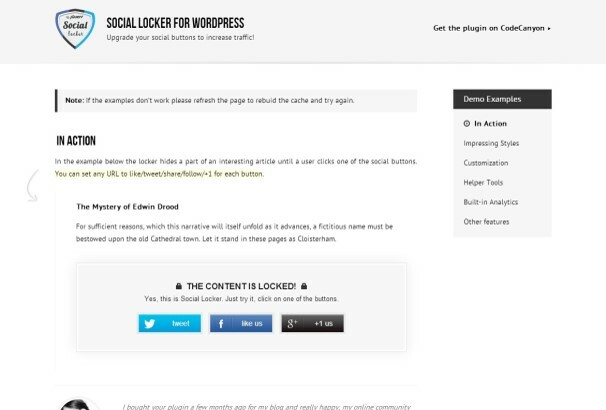 Yet another social locker plugin for WordPress which lets you users “pay” for the content with a share/like/tweet/+1 to get access to your protected content. A proven winner if you have something valuable to share. 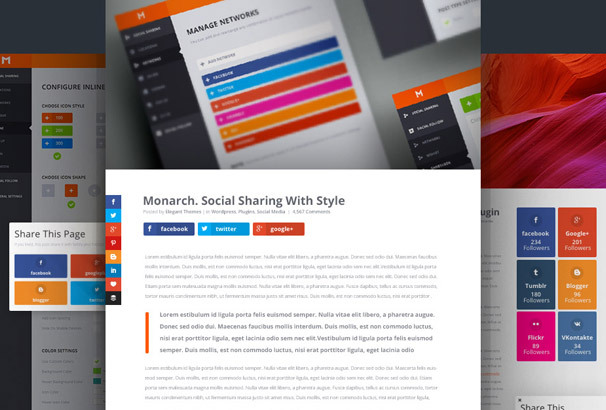 A Free and Lightweight social plugin to enable sharing of your content with a nice variety of button styles to choose from. Social Pug is a simple plugin for linking to your social media profiles so you visitors can quickly start following you there. 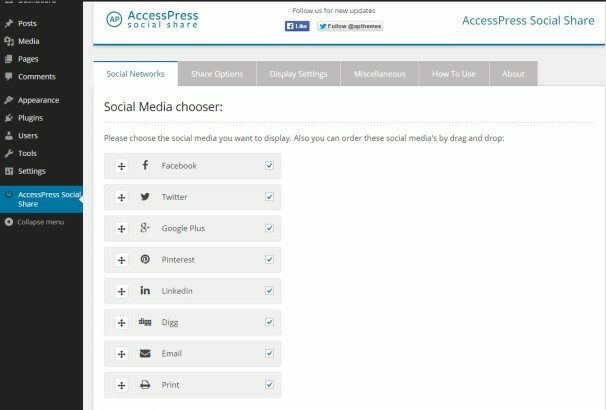 AccessPress Social Share is a free WP plugin which allows your website visitors to quickly and easily share any page, post, image or media on the most popular social networks using their APIs. 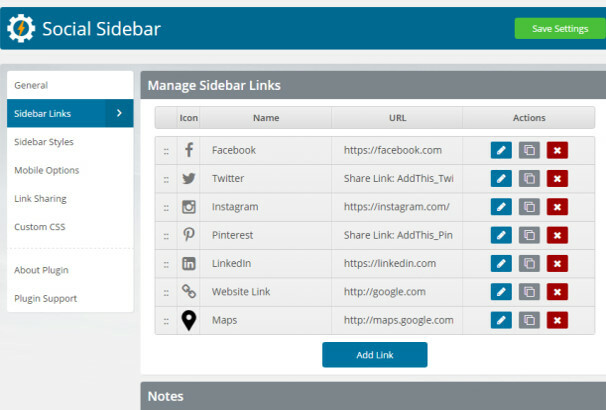 Social Sidebar is a free and very well made plugin for adding social links to the side of any WordPress website.